Alabama Graphite Corp. is pleased to provide the following independent results from downstream four-terminal sensing resistivity testing of its 100% sourced-in-USA and manufactured-in-USA ultra-high-purity, natural high-conductivity enhanced graphite battery-ready product, Delaminated Expanded Graphite ("DEXDG") for lithium-ion battery cathode applications. AGC's DEXDG's purity is ≥ 99.9999 Carbon total percentage by weight ("wt% C"). When the Company produces its core Coated Spherical Purified Graphite ("CSPG") product - engineered for use in lithium-ion battery anodes - the resultant byproduct is high-purity Purified Micronized Graphite ("PMG"). The DEXDG product is ultimately produced from the PMG byproduct material, but both products are high-value battery conductivity-enhancement materials. Management believes that AGC holds the potential for 100% of its run-of-mine ("ROM") graphite material to be effectively converted into high-performance, value-added battery-ready materials. In preliminary electrical conductivity testing, AGC's DEXDG conductivity-enhancement diluent product significantly outperformed TIMCAL TIMREX® KS4 premium primary synthetic graphite and Superior Graphite's premium-quality natural flake graphite, both commercially available conductivity-enhancement products. 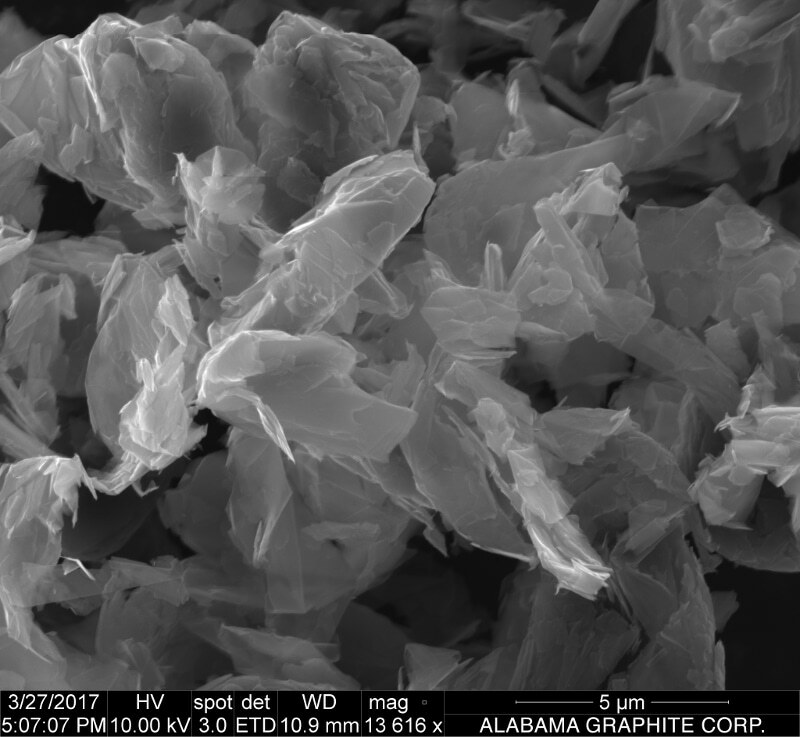 DEXDG is a form of processed natural crystalline flake graphite with improved electrical conductivity in electrode matrixes for Li-ion (secondary or rechargeable), lithium (primary or non-rechargeable) and alkaline battery cells. Additionally, DEXDG is preferable to conventional air-milled flake and/or premium-quality synthetic graphite when higher conductivity properties are desired, such as applications with high discharge rates. Derived from Expanded Graphite ("EXDG"), DEXDG is manufactured from purified flake graphite produced via AGC's specialty secondary-processing technology. Due to its superior performance in batteries as a conductivity enhancement diluent, DEXDG is preferred over competing grades of flake and costlier and environmentally harsh synthetic graphite currently being used for these applications. 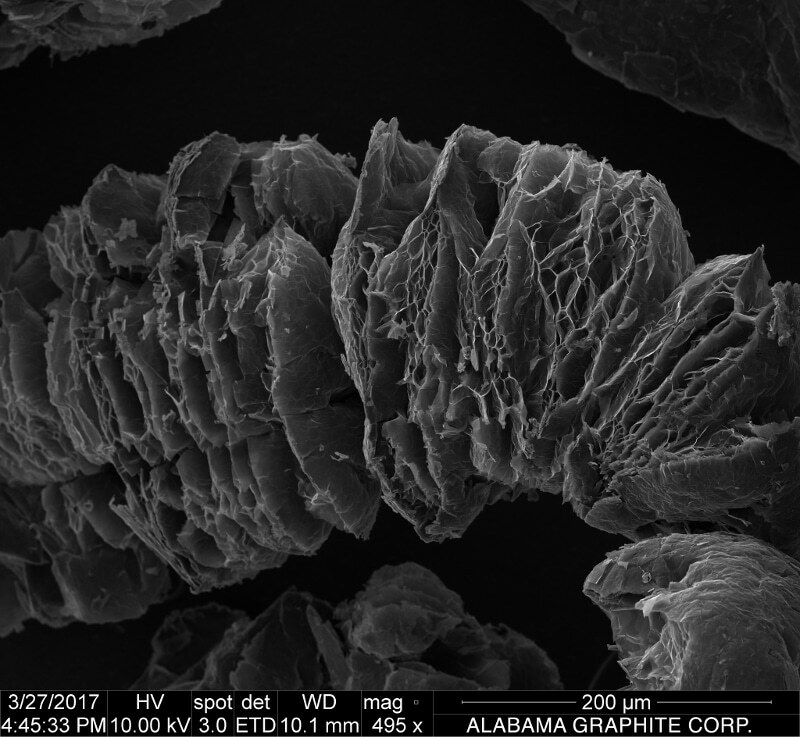 Figure 2: A Scanning Electron Microscope (SEM) image of AGC's Expanded Graphite (EXDG), which is the feedstock to produce the Company's Delaminated Expanded Graphite (DEXDG) conductivity-enhancement material for Li-ion battery cathode applications. PMG and DEXDG are used as conductivity enhancement additives in secondary (rechargeable) Li-ion batteries, primary (non-rechargeable) lithium batteries and conventional alkaline batteries. AGC currently anticipates expanding its planned secondary-processed, high-performance battery-ready product line to include DEXDG high-conductivity enhanced graphite products, in addition to PMG and the Company's core product, CSPG - identified by the ULTRACSPG™ trademark, the very first trademarked sourced-in-USA and manufactured-in-USA natural battery-ready graphite for use in Li-ion batteries. Please refer to the Company's November 30, 2015 announcement, 'Alabama Graphite Corp. Announces Positive Preliminary Economic Assessment ("PEA") for Coosa Graphite Project in Coosa County, Alabama, USA; Files Completed PEA NI 43-101 Technical Report' for more information. Note: A Preliminary Economic Assessment (PEA) is preliminary in nature, it includes inferred mineral resources that are considered too speculative geologically to have economic considerations applied to them that would enable them to be categorized as mineral reserves and there is no certainty that the preliminary economic assessment will be realized. Inferred Mineral Resources represent material that is considered too speculative to be included in economic evaluations. Additional trenching and/or drilling will be required to convert Inferred Mineral Resources to Measured or Indicated Mineral Resources. Mineral Resources that are not Mineral Reserves do not have demonstrated economic viability. There is no guarantee that all or any part of the Mineral Resource will be converted into a Mineral Reserve. DEXDG particles are not spherical by design. Instead, they are sheet-like, twisted, torn up, with multiple breaks on the surface. The more breaks, the more contact points, the higher the resultant in-matrix conductivity. It is customary to not assemble a battery for the initial assessment of performance of graphite conductivity enhancement diluent. Rather, graphite is blended with a targeted active material and confined under unidirectional load into a cylindrical pellet, whose electrical resistivity is determined by a four-point method and is measured in ohms with a milliohmmeter or a Kelvin bridge. 4T sensing is also known as Kelvin sensing. The 4T-sensing resistivity testing method is an electrical impedance measuring technique that uses separate pairs of current-carrying and voltage-sensing electrodes to make more accurate measurements than the simpler and more usual two-terminal sensing ("2T sensing"). Separation of current and voltage electrodes eliminates the lead and contact resistance from the measurement. This is an advantage for precise measurement of low-resistance values. "We are very pleased with the independent test results of our American-sourced-and-manufactured DEXDG. In short, AGC has demonstrated a substantially higher level of electrical conductivity while using less of our DEXDG conductivity enhancement, compared to competing commercial natural or synthetic grades. In terms of MnO2 cathode battery chemistries, by needing less graphite conductivity enhancement diluent, one can have more manganese dioxide in the battery and, therefore, achieve more power. Li-ion batteries are similar in that carbon black and DEXDG products are added to both electrodes to reduce the electrical resistance. With all battery chemistries, there are very finite size parameters - in other words, there's a very limited amount of room to pack in all the battery's constituents. As such, it is desirable to use less of the conductivity-enhancement graphite in order to maximize the battery's high power densities. With AGC's DEXDG, we have demonstrated that this can be achieved. "AGC's core focus has been and will continue to be our CSPG product with a primary focus on United States Department of Defense ("DoD") Li-ion battery manufacturers; however, we have also had considerable interest from numerous DoD and non-DoD battery manufacturers regarding our conductivity-enhancement graphite products," said Mr. Baxter. "We look forward to addressing our DEXDG products in the Company's forthcoming Feasibility Study." "When we manufacture our DEXDG conductivity enhancement products, it is critical to understand that our feedstock is off-spec byproduct material from our CSPG production. AGC is the only known graphite development company that has demonstrated that 100% of its primary-processed graphite material can be converted into specialty secondary-processed, high-performance, high-value battery materials. This means there is no waste. Aside from our US DoD focused strategy and our proprietary environmentally sustainable purification process, our business model is unique in that we will not sell any conventional graphite concentrate, but rather only produce specialty battery-ready graphite products." Alkaline batteries account for 80% of manufactured batteries in the United States and over 10 billion individual units produced worldwide. In Japan, alkaline batteries account for 46% of all primary battery sales. In Switzerland, alkaline batteries account for 68%, in the UK 60% and in the EU 47% of all battery sales including secondary batteries. The global market for specialty conductivity-enhancement graphite is estimated at approximately 18,000 tonnes and is forecasted to grow considerably as battery manufacturers - regardless of the battery chemistry - look to improve battery performance. TIMCAL TIMREX® KS4 primary synthetic graphite sells more than USD$18,000 per tonne, while natural graphite conductivity enhancement diluents sell between USD$4,000 to $5,000. Readers are cautioned that AGC is not yet in production and there is no guarantee that the Company will advance to full-scale production. If, following the completion of a Feasibility Study - which has not yet been commenced - AGC is able to advance the Coosa Graphite Project into production, the resulting graphite would be sourced from within the contiguous United States of America.